For other uses, see E24 (disambiguation). 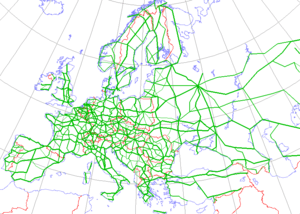 The European route E 24 is part of the United Nations international E-road network. It runs for 254 km (158 mi) from Birmingham to Ipswich. The route of the E 24 begins at the E 05 near Birmingham, where the M6 Toll merges with the M6 and the E 5 switches from the M6 Toll to the M42. The E 24 heads east on the M6 to its end at the M1 (E 13), and continues past the junction onto the A14. The E 24 crosses the E 15 (A1) at Huntingdon, and continues east along the A14 past Cambridge to the A12 at Ipswich, where the E 24 route ends. The E 30, which follows the A12 from London to Ipswich, and then the A14 from Ipswich to the port of Felixstowe, forms a continuation of the route to the North Sea. Lying (like the E 13 and E 32) completely within the United Kingdom, no part of the E 24 is signed as such, the UK authorities never having implemented the provisions for the indication of European route numbers contained in annex 3 of the 1950 Declaration on the Construction of Main International Traffic Arteries signed in Geneva by Belgium, France, Luxembourg, the Netherlands, and the United Kingdom (later joined by 18 other countries) on 16 September 1950.